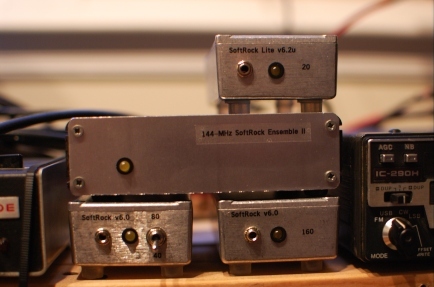 Finally got all of the SoftRock downconverters here enclosed and repaired. Turns out I managed to cross two of the wires on the input transformer of my 20-meter v6.2 Lite (“upgraded” variant). Once I found that, it sprung to life. 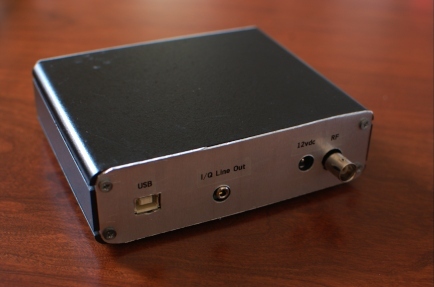 The other project was getting the 144-MHz Ensemble II VHF into an enclosure. This has been a long-standing struggle since the nearest size diecast box is just a hair too small. So, I put it into an extruded aluminum enclosure I found at Dayton a few years ago. Unfortunately, I had to make my own front and rear panels. But, I had an old minibox that was perfect for the donor material. Now, I need to actually play with some “real” SDR instead of just diddling around with Rocky (which is very capable). I’m running it under Windows XP on a 1.3 GHz Pentium IV with 1 GB of RAM. The sound card is a Creative Labs Audigy 2 ZS. There is a little latency when running a large waterfall and resizing windows, but it’s adequate for tinkering. 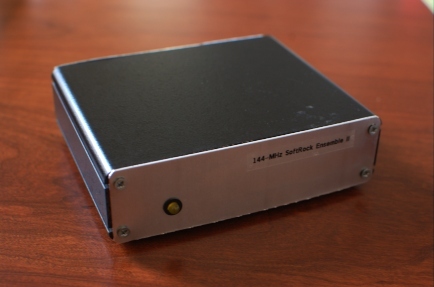 Eventually, I’d like to try some of the GNU/Linux SDR engines. But, I’m just going to wait until a new (to me) computer falls into my lap before that happens.